I had resisted for months, thinking that it wasn't for me. I couldn't really grasp what it was all about so dismissed it, but then I saw my best friend using it with amazing results. She has found contacts, friends, gained advice and even work experience all through her 'tweets'! I signed up a month ago as @thisiswiss and although it took me a little while to get used to the pace, and writing with only 140 characters, I soon became hooked! It seems the whole world is on Twitter and whatever your interests there will be like-minded people to follow. I have discovered a whole new world of crafters, mums, cooks, runners (and Gok Wan!) and love sharing and receiving tweets about what's going on. I've even met up with some people in 'real life' ! I did sign up with the intention of promoting This is Wiss but when someone contacted me wanting to make a purchase I was bowled over! 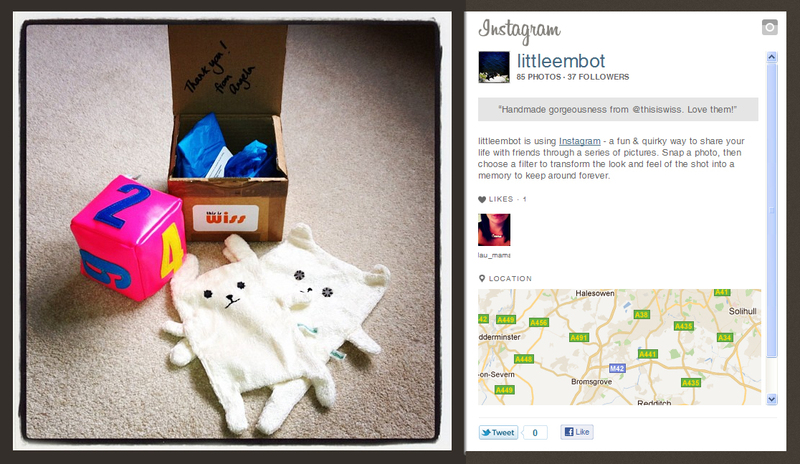 @LittleEmbot ordered a Square Bear & Hare and a Fluoro Dice...and then tweeted all her followers when they arrived, telling them how happy she was! I know I'm late to join the party, but if you haven't joined Twitter already then I suggest you give it a go. Come and find me on there and say hello! It really has opened up a whole new world to me...the only thing is I still only have 24 hours in each day. There's so much to do I wish I had more!